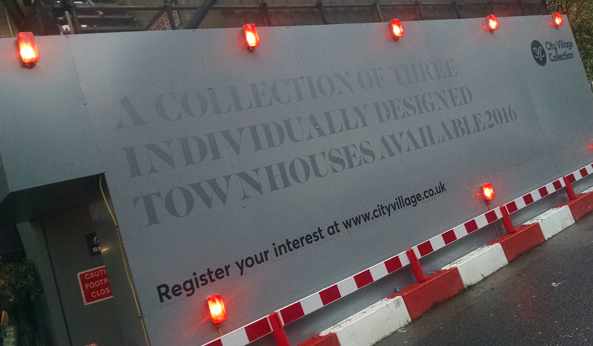 Printed panels are a fantastic way to dress a site hoarding, especially when you have a large hoarding print or very detailed design idea that would be fiddly to create using vinyl stickers. When it comes to adding graphics to a site hoarding, the two best methods of application are either cladding with composite panels then adding vinyl stickers, or digitally printing the panels. The benefits of digital printing are that you can have literally whatever you want on the panels, and the scope for size is much, much larger. You can create a patterned background, add photographs or 3D real life mock up images, or use a series of panels to create a large hoarding print. With large hoarding prints you have the option to create a modular print, where the hoarding is split into different sections, or one continuous run of print to cover a very large area. Here at Lavastar we have extensive experience with large hoarding prints, and use specialist inks to reduce UV damage, and prolong the life of the printed panels. We also have the machinary to laminate the panels to further protect them from any scratches or general marks of wear. With over 20 years in design experience and the latest in high tech printing and laminating equipment, we can manage any large hoarding print project no matter how big or complex. We take care of projects from the planning and design stage right through to production and installation and love being let loose with any creative ideas you may have. So get in touch and let us make your hoarding something special.